The source of China's unique qualities is their wide-assortment of Home City shipments. In particular, the Chinese have access to Migration cards, which replace the typical two or three villager shipment cards. These cards allow the spawning of villagers from all town centers and villages. However, waiting to send the card could prove beneficial, as it will allow you more time to build more villagers. Another interesting feature of China is that it will have a higher population cap than any of the other civilizations. This fits in well with the idea of China having the force of numbers that they traditionally have had. In addition to that, China's army reflects their larger population. Instead of training individual units, they will train banner armies from a single military building: The Military Academy. These armies are usually a mixture of two unit types (light or heavy infantry, cavalry or infantry, etc) and train in bulk. For instance, the Old Han Army produces Chu Ko Nu archers and Qiang Pikemen. Similar to Russia, these units will be slightly weaker than the typical soldier, but not severely so. They will also train relatively fast. One drawback could be that a player would be unable to train solely one type of unit as a counter (pikemen cannot be trained alone if your opponent was using a lot of cavalry). But not all of China's units are weaker than average, for they are able to produce an extremely strong variety of artillery. For example, Flying Crow Rockets can be trained early in the game through the use of a wonder, or the Flamethrower can be trained from the Castle in age 2. 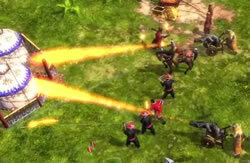 Many of their wonders also produce a free stream of units, which helps China to have an advantage in numbers throughout the game. Fire! - the Chinese discovery of gunpowder is mirrored in The Asian Dynasties with some Chinese seige units having some seriously hot capabilities. In terms of economics, the Chinese are also rather strong. The villages that they can build are a combination of a house and a livestock pen. Villagers are also able to garrison in it, and with the use of the right cards, it can even fire upon enemies. Other cards spawn either a goat or a water buffalo at each village, similar to how the migration card works for villagers. One very powerful card, available in the Industrial Age, combines both ideas and ships a villager and a fattened goat at each village and town center. Yet another card allows the Chinese to train 'irregulars', their version of militia from the villages. There is even a card to ship an additional Shaolin Master monk and one that ships a trading post wagon called "Trade Empire". Other Chinese shipments help them to mass units in battle. There are cards that send large armies for an equally large amount of food. Confucius' Gift allows all technologies to research instantly, and all home city cards to arrive very quickly. If this were to be combined with the large army shipment cards, it could result in a very powerful industrial age force. An example of one of these large industrial armies is the "Every Victorious Army", which ships iron flail heavy cavalry and flying crow artillery for a cost of 2,000 food. This type of unit shipment, mixed with their weakness at countering units forces China to be primarily an offensive civilization.